The elite force was supposed to protect the emperor and his palace, police Rome, interrogate and guard the emperor’s prisoners as well as to put down any revolts within the city. Furthermore, it was the lone military unit allowed in the empire’s capital. As Octavian, the future first emperor Augustus Caesar, had seen his uncle, Julius, stabbed to death, he understood that it was necessary for the ruler of Rome to retain a group of loyal bodyguards. Augustus picked up the best soldiers to protect him. The Emperor did not skimp on his safety, for the Praetorian Guard was formed by the best and most courageous legionnaires, who were paid higher wages than the average soldier and would reside in the ruler’s palace. While at first Praetorians earned 50 % more than the regular soldier, eventually Augustus raised their remuneration to three times the pay of a common legionnaire. The service term was 16 years. The Guard was organized along the lines of the legion. It was composed of ten cohorts of some 500 men each. Three of the cohorts were garrisoned in Rome and the other seven closed by, but outside the city. A commander with the title of praefectus praetorio was in charge of the corps. Contrary to popular representation, the Guard’s uniform was not military, much less black – but a traditional Roman toga, probably to apparently comply with the tradition of no armed soldiers in Rome. Upon Augustus’ death in 14 AD, the Guard began its swift and bloody ascent to power. Its wily commander, Made Sejanus, convinced Emperor Tiberius to build the Praetorian Camp within the city. With a foothold in Rome, Sejanus ended up governing the city while Tiberius moved to Capri. Eventually Tiberius had Sejanus put to death and named Macro to head the Guard. It is said that Macro aided Gaius Caligula in chocking Tiberius while the Emperor recovered from an almost fatal illness. 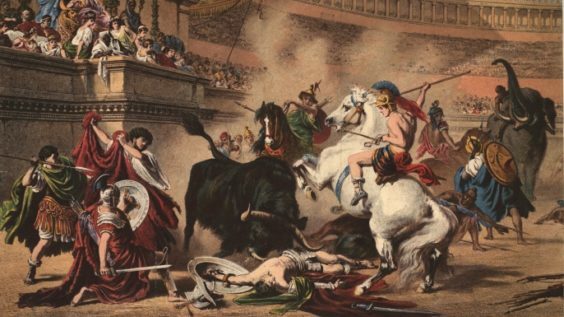 In turn, Caligula put Marco to death and the Guard murdered the infamous Emperor and proclaimed the whimpering Claudius as ruler of the Empire. For the next 300 years, the Praetorian Guard appointed and deposed emperors; bullied public officials and persecuted anybody who would curtail its power. Through his extensive transformation of the Imperial system, Emperor Diocletian (284-305) managed to diminish the size and political power of the Guard. But the Praetorian Guard final appearance in the political arena occurred when in 312 AD they supported Maxentius against Constantine. At the Battle of Malian Bridge, Constantine’s legions defeated units of the Guard loyal to his opponent. One of Constantine first edicts was to do away with the Praetorian Guard. The popular view of the Praetorian Guard is extremely negative for it is seeing as a treacherous, self-serving, ruthless corps of mercenaries. Today, the term Praetorian Guard, is sometime applied to fanatical, tough, cruel followers of a person or idea. Historians, however, balance the unenthusiastic view of the public with the fact that for the first 200 year of existence the Guard was a positive, stabilizing power in Roman politics. It deposed or allowed the deposal of vicious, weak, detested rulers and backed honorable, dedicated, well-liked emperors. The Praetorians also kept the Roman masses in line and kept the plotting of Senators in check. The stability the Guard helped create was in no small part responsible for the longevity of the Roman Empire.